How would you feel if you couldn’t read or see words clearly, or understand what other people are saying? How would you communicate with others if self-expression was a challenge? What if you couldn’t tolerate the feel of certain textures or the tastes and odours of certain foods? 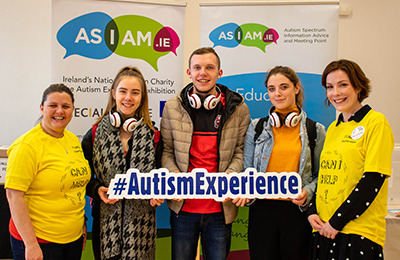 As part of National Autism Awareness Month, Institute of Technology Carlow’s Student Services department will host a series of talks and a special exhibition - the AsIAm Autism Experience Exhibition - today and tomorrow (1st and 2nd April, 2019). In 2018, approximately 1 in 59 children were diagnosed with an autism spectrum disorder (ASD) while almost half of 25-year-olds with autism have never held a paying job. The AsIAm Autism Experience Exhibition, which takes place in the Barrow Centre, will invite visitors to “step into the shoes” of someone living with the condition and gain valuable insight, in an engaging way, into the challenges faced on a daily basis by individuals on the Autism Spectrum. Through the exhibition, IT Carlow hopes to raise awareness of ASD and encourage inclusivity across the campus and into the community. Social Care and Early Childhood Education and Care degree programmes will find this exhibition particularly relevant. A number of talks will also take place today and tomorrow to discuss areas such as Autism Friendly Communities, Autism Friendly Third Level Institutions, Autism Friendly Internships, Recruitment and Employment. At 12pm today in room D502, Aisling Foran from AsIAm - Ireland's national Autism charity and advocacy organisation - will give an overview of the importance of inclusion in the community. Including group discussion and interaction, the session will cover the basics of being on the autism spectrum, challenges and employment issues, and the work of AsIAm in response to these challenges. Following Aisling’s talk, Peter Brabazon, General Manager of Specialisterne Ireland, which provides assessment, training, education and IT consultancy for employees with autism, will talk about preparing students with ASD for the workplace and helping them effectively communicate in a way that builds their confidence and awareness of their own skills and challenges. A second talk, from 1pm to 2pm, will see Peter Brabazon discuss autism-friendly internships: the skills required for securing an internship; the supports offered to interns with ASD; and the supports offered to employees and employers who are working with the interns. Katie Quinn, Youth Engagement and Programmes Officer with AsIAm, will discuss her role in the Autism Friendly University initiatives. Two discussions will take place tomorrow at 12noon and 1pm in F209 of the Barrow Centre. Fiona Ferris of AsIAm will outlined the ‘Teach Me As I Am’ training she developed and has delivered to 600 early years professionals to address best practice approaches to supporting children on the Autism Spectrum and their families during their preschool journey. Peter Brabazon of Specialisterne will deliver his talks from the previous day on recruitment and employment, and on autism friendly internships.